On Wednesday night, Photosynth, a technology demo from Microsoft Live Labs, is graduating from its "ooh, that's pretty" status to being a viable Web service for consumers. 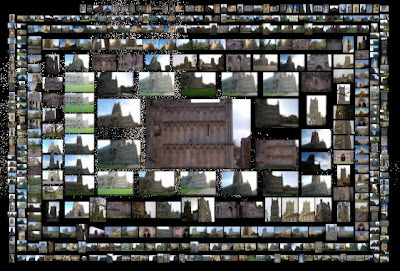 The technology, which takes a grouping of photographs and stitches them into a faux 3D environment, can now be implemented with photos you've taken on your digital camera or mobile phone, and converted right on your computer. Previously, the process of stitching these photos together took weeks of processing on specially configured server arrays. With its latest version, Microsoft has managed to shrink that into around the time it takes to upload your photos. Microsoft is giving users 20GB of online storage for their Photosynth collections. Photosynth product manager Joshua Edwards tells me this can easily fit 60 or more "synths" made up of around 150 to 200 photographs apiece--the higher end of what's recommended for what Edwards calls an optimum or "synthy" experience. Users who are making really neat collections will be granted additional space. One of the most impressive parts of Photosynth is how damn fast it is. Over a decent broadband connection you'll immediately see large thumbnails that quickly begin to sharpen as data fills in the missing pixels. You can continue to zoom into these areas and they'll sharpen up even more on some of the super high-resolution shots. 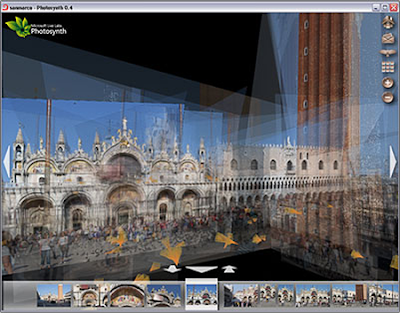 The streaming and rendering technology behind Photosynth is Seadragon, another project from the Microsoft Live Labs universe. Users have always had to download a special Seadragon-based plug-in to view other people's synths. The new twist with the latest plug-in now comes with a desktop uploader that can be used to add your own collection to the Photosynth universe. This runs with complete autonomy from your browser, so you don't have to worry about it stopping if you close out your browser. It also works in both IE 7 and Firefox 3, making it cross-platform--at least for Microsoft. If you're a Mac user looking to get your hands on some Photosynth action you'll have to keep waiting. The focus on Photosynth will remain on the PC for the time being. So,this could be "Sweet" or "Sour" depending on the Operating System you use, because this works only on WINDOWS!